Has anyone every noticed that “wrapup” is such a weird word? That makes a lot more sense now. Hey guys, and welcome back to my blog! I hope you all had a wonderful Christmas! Big thanks to everyone who watched my Christmas AGSM as well – if you haven’t watched it, be sure to do that right now! I did a 2017 wrapup at the end of last year, and it was really fun so I decided to do it again. And . . . let’s go! The other big thing that happened in January was the release of one of my series, Travels With Grace. Grace actually went to Washington State with me for Thanksgiving of 2017, but I didn’t release any of the pictures until January 2018. She visited her cousins Grace, Lea, and Cara, while I visited my cousins S and M.
In February, I did a hilarious How Much Does AGs in Alaska’s Brother Know About AG? post, which had some great results. I also posted on The Customization of Tessa Elizabeth, where I showed you all how I created my customized TrulyMe doll. I also launched another series, “According to Crystal,” with my “Valentines Day According to Crystal” post. In March, I did my first guest post with my rabbit Moe, who was more popular on blog than I thought was ever possible. Seriously. You guys went gaga for my little rabbit. And for good reason, too – he’s adorable!!! I also did my first collab with my friend Elysium, from Prompted Pens! I celebrated two huge milestones in March – first, reaching 1000 likes on American Girls in Alaska, and second, my three-year blogiversary on WordPress (I started blogging long before my AG blog, for those of you who don’t know). In April, we celebrated Easter . . .
And then went to Texas! I brought back Travels With Grace for that one. In May, we celebrated Crystal’s 15th birthday! Then, I celebrated my one-year blogiversary with a tee-shirt giveaway! Our winners were Dianne and Faith. June was fairly boring. I went on a hiatus, so that was pretty much it. In July, I did a Patriotic Photography collab with Chachel from Wild Sketch, which was super-duper fun! In July, I announced the arrival of our adorable Chihuahua puppies, Jaxon and Callie, who my family had adopted a month earlier. I also did Take 2 of “A Summer Photoshoot,” which I did the year before as well. This time around, I used Lindsey instead of Crystal, but we went to the same park. In August, I welcomed a new doll into the family – Luciana Isadora Vega! And then came her debut photoshoot. Crystal made another appearance on “According to Crystal,” this time with a back-to-school version! I was super lazy in September (I’m kidding, school started so I was a little busy), and I only did two posts – introducing Tessa’s rabbit Mischief into the family, and then a photostory about him. Then came October, when I did an adorable fall photoshoot, “Pumpkin Pals,” with Molly and Luci. And we had a family meeting, with interesting results. I also shared some of my best non-doll-related pictures. On Novemeber 30th, Alaska was shaken by a huge 7.0-magnitude earthquake that struck southcentral Alaska, 10 miles north of Anchorage. I started December off with a ballet photoshoot of Tessa in my backyard. And then . . . dun dun dun . . . I revealed my HUGE CHRISTMAS SURPRISE!!! 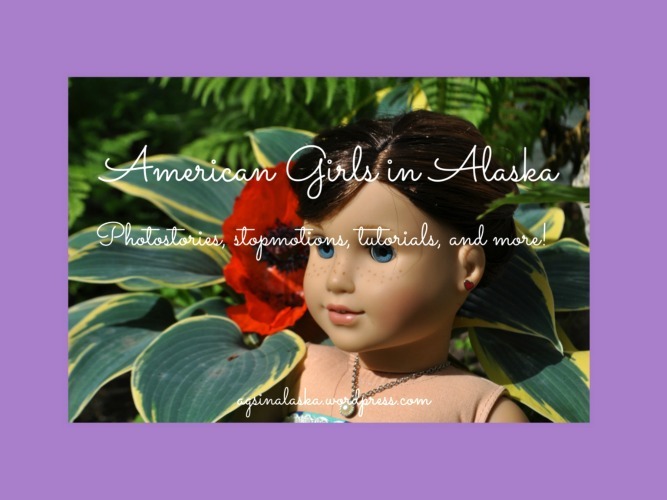 It was a holiday American Girl Stopmotion, which I posted on my brand-new YouTube channel! And that just about wraps up the year! THANK YOU GUYS SO MUCH for such an incredible year! You are all AY-MAY-ZING and I can’t wait to have another great year of blogging, and the occasional YouTube video, shared with you guys! Much love from the AGIA family! I cannot believe it’s been another year already! Where did the time go? Okay, okay, enough of that. I know that you all want me to hurry up and reveal The Big Surprise already, so . . . here you go. AND, MORE IMPORTANTLY, I MADE A CHRISTMAS STOPMOTION!!! I have been working for HOURSSSSSS on this project and it’s FINALLY complete. Here’s a link so you can go check it out rightnow. I know it’s not the best AGSM you guys have ever seen, but PLEASE WATCH IT IN HD TO GET THE BEST EXPERIENCE POSSIBLE! Sorry about the caps lock. I’m really, really excited. Anyway, I hope you guys have an AMAZING Christmas and a very, very happy new year! Disclaimer: This post is written satirically and Crystal’s advice should most definitely NOT be taken – that is, when it comes to Christmas shopping. Grace: Did you say Grace and presents? Crystal: No, Grace! Now, go away! I’m doing a blog post here! Crystal: *sighs* As I was saying, if you’re not going to spend all of your money on yourself, Christmas shopping for others is such a fun thing to do. And when you have eight sisters, they all want presents, for some weird reason. Tip #1: When in doubt, buy the most expensive pair on the rack. Expensive clothes always impress girls, whether you’re a guy shopping for you girlfriend or a girl shopping for her sister. Expensive=meaningful! Grace: That would explain your Tiffany addiction. Crystal: ARGH, GRACE! GET OUT OF HERE – RIGHT NOW! When you’re shopping for your least favorite sister – that would be Lindsey, due to some unfortunate shoe-burning – don’t be afraid to give her ketchup packets or pencil stubs. Tip #2: When in doubt, wrap anything you find lying around your room. Next up – shopping for your parents/person who writes blog posts about you. Put some thought into this gift – after all, this is the person who spends hours photographing you, writing up cute posts, and then gaining a ton of followers because she did a nice job on your hair – oh yeah, and because AG bloggers are super nice people. Tip #3: It’s totally okay to copy present ideas! The original person won’t mind, usually. And, last but not least, shopping for that special someone. Tip #4: Boys are impossible to shop for. Just go to your nearest Safeway and grab any old hoodie off the rack. Since boys don’t care about clothes, it doesn’t matter what it looks like. Hey, it’s the thought that counts, right? And that’s all the time we have for today! I hope this post was helpful and inspiring. May you all have long lives and wear fashionable clothes! Grace: Is there no end to your vanity, Crystal? Ah, finally! AGsinAlaska is posting wintry pictures! Well, not exactly wintry . . . considering that it’s currently 34 degrees outside, everything has melted, and our backyard smells like dog pee (you know what I mean if you live anywhere that has a mud season). Just one problem – IT’S NOT SPRING. According to my whiteboard calender, it’s only December 3rd. Plenty of time for Christmas posts, I guess? Hey, guys! I hope you’re all having a fantastic Thanksgiving. Honestly, I feel like I was just doing this – as each year passes, the time flies faster. If you’re not in too much of a food coma, I hope that you’ll take a few minutes to read this post. The poems are not mine, and I’m not quite sure who wrote them exactly, but I thought they would be appropriate for today. I’m accompanying the poems with pictures I took of things other than dolls. Quick warning, though – they’re completely unedited (except where I blurred out the info on Jax and Callie’s collars). 🙂 So if you dare to look, go ahead . . .
Let me know what you thought in the comments, and tell me all about your Thanksgiving traditions and feast! Hey guys. Before you begin another yawn-inducing week at school (or incredibly thrilling, if that’s how you feel), please take the time to read this post! For my big Christmas post this year, I decided to do something a little bit different and very time-consuming. So if you don’t notice many posts from me in your Reader, that’s why. However, this does NOT mean I’m going on hiatus. Instead, I will be posting maybe once every couple of weeks until my big Christmas spectacular, since I will need lots of time for that. I hope you all have a wonderful holiday season. I’ll see you all in my Thanksgiving post, if not before that. To make it up to you, please admire this adorable picture of my Chihuahua. P.S. If you have not been reading my posts on my website, please take a minute to hop on over there right now. I made a couple changes to suit the fall season.